Dailies AquaComfort Plus Toric are a daily disposable soft contact lens designed for people with astigmatism, who want a lens that is comfortable and convenient, and provides clear vision throughout the day. Simply wear it once and throw it away - you don't need to bother with solutions or cases. Manufactured by Alcon (previously Cibavision), Dailies AquaComfort Plus Toric use 'Lightstream Technology' for thin, streamlined contact lenses that provide good edge comfort and crystal clear vision. 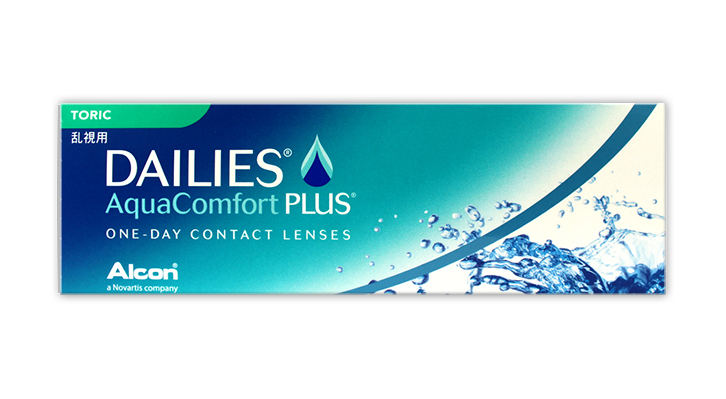 In addition, the contact lenses use a blink activated moisture technology to deliver refreshing comfort all day. Be the first to write an online review of Dailies AquaComfort Plus Toric and share your thoughts on this product with other shoppers!